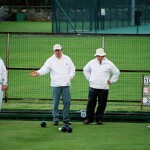 Filed under Lawn Bowling and tagged "Blandford", "Bowls results", "Shaftesbury"
Blandford bowling club hosted 20 visiting members of Beckenham and Bromley District Bowling Association. The association takes bowlers from 23 clubs and are touring the Bournemouth area. Filed under Lawn Bowling and tagged "Bowls results", "Wiltshire"